Breeding Horses is my Game! In racing, it is usually the jockeys and the trainers that get all the accolades when a horse does well on the track. The owners are also involved as they get to celebrate the success in the winning owners lounge and for some – likely to be a bigger celebration after the races- especially when putting the winning photo up on the wall (with all the others). There are many people involved in the game that do not get attention and some of these people are key players in the game of racing. All the success that the owners, trainers and jockeys get to enjoy would not be possible without a particular person- The Breeder! Breeding race horses requires a lot of time spent looking at bloodlines of both sire and dam, working out what mare to send to which stallion, thinking about how will the mating plan work, what kind of foal will arrive amongst many other things. These are the things that most of us tend to forget about when celebrating our victories- because not only is it a victory for the connections, itâ€™s a victory for the individual or business that did the mating plan and bred the future star. This weekâ€™s Winning Wednesday we got to spend some time with Breeder – MauriceÂ Sinclair to learn more about him and why he got into the breeding game. Maurice, thank you for your time- tell us a little about your involvement in racingâ€¦â€¦. Q1. When did you get involved with racing? I used to sell Sun Herald newspapers at race tracks when I was 11 and12 years old. Those days you had a break from selling between Race 1 and the last race. So we used to go into the course and punt our hard earned away until the last race. I had a penchant for remembering Jockey and horse names for some reason. Also I remember the radio being tuned into 2KY growing up and my fatherâ€™s TAB tickets. They were all coloured pink for Sydney, blue for Melbourne and I think green for Brisbane. Q2. How are you involved with racing now? I formed a partnership with my close mate Colin Bell about 28 years ago. He is a fantastic partner and of similar ilk. We race horses in several jurisdictions around Australia depending on the horseâ€™s ability.Â In addition we have been building a breeding business for many years. Â Q3. What is it like to be a breeder/Lessor? Why did you choose this avenue? Breeding offers many new challenges, trying to marry confirmation, pedigree and budget to get a commercial outcome is not much different from punting.Â It is high risk and potentially high return.Â I used to scan the Sunday papers for nearly 40 years to read Saturdayâ€™s race results. I would check Sires, Dams, Ownerâ€™s etc. without really knowing why. I have always been attracted to the breeding side. We also purchased a run down, pre training, breaking and Agistment property at Cranbourne from Len Treloar, whom we had several horses with.Â Len was going to Singapore to train and the timing was right. We employed some excellent staff and built a solid business with some large Melbourne trainers as our customers.Â We sold it a couple of years ago but this venture provided us with many insights and knowledge into a part of racing usually unexposed for owners. We started to build our horse numbers up slowly during this time and we purchased our first broodmare La Rouge. She is by Red Ransom and out of a Zabeel mare so she wasn’t short of good blood.Â Unfortunately she was slow and couldn’t run out of sight on a dark night. 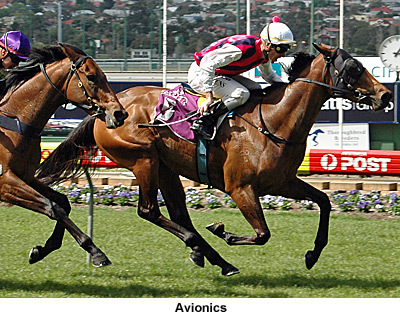 It was around this time that we raced the bulk of our horses in Melbourne and it was those connections that led to racing in Adelaide as well. Q4. What has been the best horse you have been associated with and why? I really enjoyed racing Avionics. 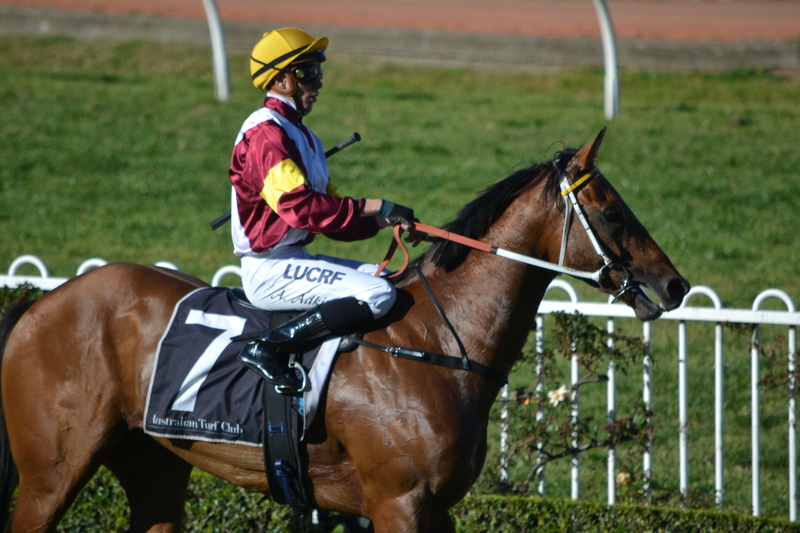 She was a quality mare who won over $400k in prize money. She should have won some Group races however a combination of factors always seemed to conspire against her. She was tough and gross and always gave her best.Â She is now part of our successful breeding business and in partnership with Glen Eagles Stud in Yarra Glen she is a mare that just keeps on giving. Although she doesn’t have much to show (thus far) we are really enjoying Don’t Doubt Marley. Robbie Griffiths said she was a Group horse and unbeaten at two and as an early 3 year old was racing against the best fillies in the country.Â She has been out injured for nearly a year with a fractured sacrum. This is fixed now so hopefully we will see a better horse as this is another one that just gives her all in a race. Q5. When one of the horses you have bred and/or own wins, how do you like to celebrate? Special place you go? Certain friends you share it with etc. We have not bred too many as yet although we have sent 7 mares this year to stud. Our first home bred was Stryke A Ransom (Stryker x La Rouge) and she is showing lots of promise. Kim Waugh trains her and in her first race she was just beaten by multiple city winner Sugar Bay Leonard (Encosta De Lago x Sugar Bay- Trained by Joe Pride). She then came out and beat some handy ones at Gosford. Last prep she was beaten a nose by another smart one, Hussterical (Beneteau x Hussterics)Â Trained by Gai Waterhouse & Adrian Bott). She is back in work now and we can’t wait to see her return. She certainly has talent and Kim has a lovely gentle approach to training her that seems to bring the best out when she races. Q6. 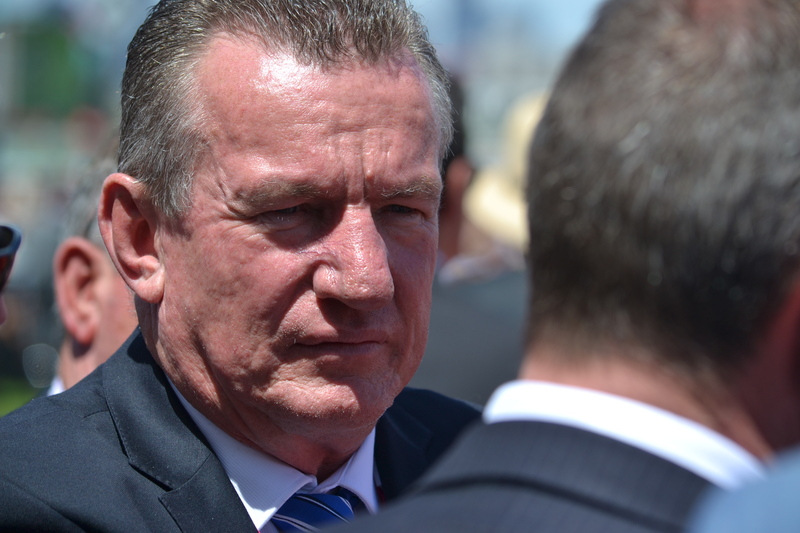 You lease horses to the From The Track Syndicate, how did this partnership come about? I knew Alan Hardes from Newcastle Jockey Club (NJC) as he was on the Board.Â I knew he leased horses and we like to share our horses and bring new people into racing as well. I gave FTT syndicate a share in a filly by Casino Prince x Miss Tendulkar and unfortunately it wasn’t very good. So I felt bad about that and then gave them a decent share in a beautiful Poets Voice x Regal Fun filly, we purchased from Inglis Sales which one of the syndicate members named as Delmira. She also turned out to be a bit of a hot filly and we tried many ways to get her to improve. Unfortunately she didn’t and the only two horses I have given FTT have been the only 2 of mine that never won a race. All others have.Â I know many of FTT syndicate who have done a wonderful job getting people into racing. I will wait and when I have a good one I would really like them back in as I feel I owe them. It will happen. Â Q7. What is it about the Thoroughbred that interests you? Being around horses is cathartic for me, I feel relaxed and at peace with myself. It is one of the few moments where I am entirely lost in the moment. I love the different personalities they have. We have a decent share in a Snitzel colt with Paul Perry that looks promising. He has an arrogant personality and on the other hand we have a beautiful mare by Poets Voice with Kristen Buchanan who has the sweetest nature. Â Q8. Have/Do you had associations with any race clubs? If so which ones and how were/are you affiliated? I am a member of ATC and NJC and these two memberships give access to many other race courses. In 2009Â I had a sea change from many years in the Corporate sector and took up the challenge as CEO of the NJC.Â I loved that job and it gave me the opportunity to marry my passion to my work and meet many new people.Â I used to love spending time with trainers, members, jockeys and other participants in racing and have built a wonderful network as a result. Newcastle is a beautiful place to live and work and everyone told me I wouldn’t leave and they were right. Q9. When not involved in racing, how do you like to relax/have fun? We put a lot of time into our Family transport business and outside of that l love to spend time out at sea, fishing or enjoying the more passive boating on Lake Macquarie. But the most precious time of all is reserved for my Grandchildren and my Son and Daughter and their partners.Â I just love it that we have such immediate access to such wonderful restaurants and we often go up to Hunter Valley for a long lunch. Q10. If you could only pick one- Winx or Black Caviar? Why? I love Winx she can sprint and also race over the classic distances. She is tough and she can handle all track types.Â To compare is like trying to compare a top of the range Ferrari against a top of the range Lamborghini both are exceptional.Â Both have made enormous contributions. But to win two Cox Plates and probably a 3rd this year is just an amazing achievement. We all knew how good Kingston Town was, well keep watching this mare. Q11. How are you going this year and what do you put your success down to? This year (calendar) we are on target to better last year with a good Spring expected. We have some talented horses coming back or starting out so we can’t wait.Â Our success is driven by many things including selecting the right trainer for the right horse, selecting the right area to race. Not all make city grade.Â Buying or breeding the right types of horses to match your goals is critical. There are many factors that underpin performance and eliminating as many variables that reduce a horseâ€™s performance is critical during the selection process. It is akin to punting where I tend to cross out horses that can’t win rather than look for a winner.Â That way a short list emerges and this has proven to work for me anyway. Finally you can’t have success without attention to detail. From how the horses are broken to how they are grown out to be ready to raceÂ to the choices the trainer makes about placement, race frequency and a thousand other micro decisions to agistment, pre-training and other spelling decisions are all critical elements of success. We have most of our horses including our broodmares agisted at Watagan Grange and I would like to take this opportunity to thank them for their care of our equine interests.